Earlier this year, Facebook broke some bad news. Organic reach is officially being choked, making it harder for brands to reach the audiences they’ve worked so hard to build. Because of this, I believe marketers will look to SEM (search engine marketing) to recapture lost attention. The problem is, there’s already so much competition. How do you get past the noise and generate PPC (pay per click) results, and which KPIs (key performance indicators) should you be tracking to measure success? Optimizing conversion rate (CVR) is one of the fastest ways to improve AdWords efficiency. It allows you to test new approaches and boost ROI without having to expand target keywords, campaigns or budget. Here are five approaches to PPC that will help you generate more conversions and better results in 2018 and beyond. Google’s entire business model relies on providing searchers with relevant results. This goes for organic results as well as AdWords. Ad relevance (in other words, how relevant the keyword is to the ad copy you serve). Many PPC experts consider CTR the most important factor when determining QS. Therefore, when looking to optimize your QS, start with CTR. Analyze the keyword relevancy of your campaigns. Is your ad copy aligned with the search intent of the keyword? 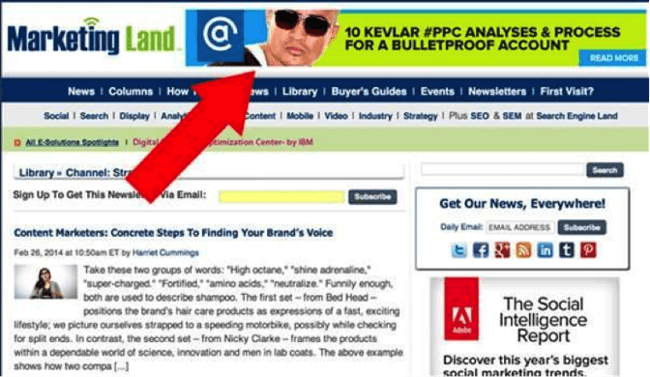 It’s good practice to create separate Ad Groups for each of your keywords. Also known as Single Keyword Ad Groups, this is where you cater to the intent of specific searchers rather than a larger group. 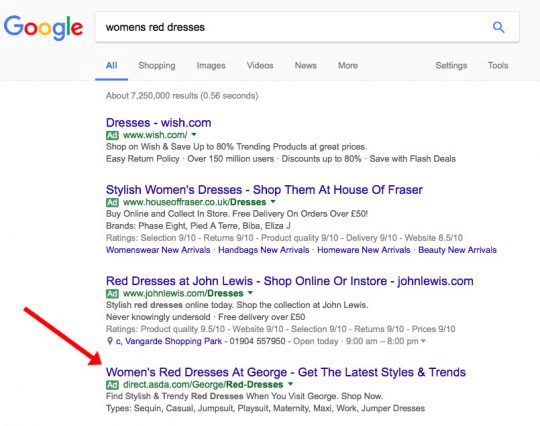 In the example below (courtesy of ConversionXL), ASDA is the only advertiser for the term “womens red dresses” with copy tailored to that search term. As well as relevancy, your ad copy should quickly sell the benefits of the “click.” In other words, why should the searcher pay attention? Make your headlines relevant, focusing on the desires and pain points of your audience. By optimizing CTR, and therefore quality score, you’ll generate more qualified traffic. And high-quality traffic delivers better conversion rates. Once you’ve optimized CTR, your landing pages should be the next target. Dynamic text replacement (DTR) can provide some quick wins. This “swaps” specific copy in your landing page based on the keyword the user searched to find you. DTR can improve quality score and therefore contribute to a higher CVR. When it comes to AdWords, high bounce rates are a fact of life. Users who come to your landing pages are at various stages of the customer journey. For example, a call-to-action (CTA) for a demo won’t work on a searcher who is still educating themselves on different solutions. To capture these missed opportunities, use remarketing to cross-sell and “down-sell” bounced visitors. Let’s start by expanding on the example above. If you’re offering a demo of your software to someone who is still in the awareness phase, this approach won’t be as effective as something that answers their questions. Therefore, an e-book that teaches prospects how to overcome specific challenges is an appropriate down-sell. It would educate them on the options available to them while providing information about how your product makes the process easier. Of course, these challenges will vary depending on personas and customer segments. Therefore, you must personalize your ad creative where necessary. Retargeting in this way allows you to capture lead information that would have been otherwise lost, boosting the CVR and overall ROI of your campaigns. The mistake many marketers make here is to “re-sell” the demo request. Use it as an opportunity to educate them and add more value instead of forcing them further down the funnel. Test different lead magnets: Different personas and customer types respond to different forms of media. Split-test your remarketing ads to offer an e-book and webinar. See which generates the highest conversions and double down on those formats. Name-drop influencers: If you work with well-known influencers in your space, consider including them in your remarketing ads. This association adds an element of trust like no other. Use dynamic targeting: Serve specific ads to different audience segments. More on this later. The point of remarketing is to capture lost users and retain customers. Don’t waste the opportunity by serving the same messaging. Look for ways to add value up and down the funnel. AI and machine learning bring the promise of higher-performing marketing at speed. From an AdWords perspective, this would mean automated bid and budget management, using more data than a human can handle to make adjustments in real time. An average increase in conversions of 71 percent. A median increase in conversions of 22 percent. Discussions of landing page quality aside, the huge difference between average and median is explained by the fact that a certain number of accounts saw extremely high increases in number of conversions, which skews the average in a meaningful way. If we wished to exclude those extremes from the discussion, we would look at the median score, which tells us the percent increase in conversions that was observed for the 50th percentile. The plot thickened because this increase in conversions came with an overall decrease in cost per acquisition (CPA). In fact, the median CPA had a decrease of 18 percent, with 64 percent of the group enjoying a decrease in CPA overall. Machine learning martech helps PPC marketers scale and optimize marketing activities efficiently, but it’s also a serious contender for conversion boosts. Here’s the thing: Machine learning technologies get better the more they learn. In other words, results will improve as machine learning algorithms react to new findings. 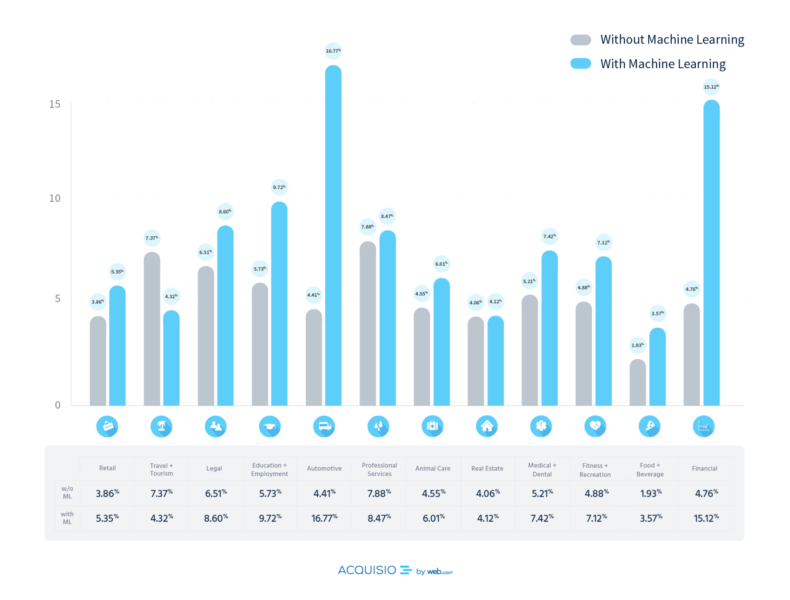 Check out The Marketer’s Field Guide to Machine Learning for more information. To cut through the noise, you must capture as much SERP (search engine results page) real estate as possible. This means not only standing out with your creative but also expanding how much room your ads take up. Sitelink Extensions: Provide links to other relevant pages on your website. Callout Extensions: Additional information on what you’re offering, e.g., limited stock and free delivery. Structured Snippets: Allows you to highlight specific elements. For example, if you’re selling “Italian vegan leather boots,” you can include a list of shoe sizes. Location Extensions: Include your business address and telephone number in your ad copy. As you’re well aware, mobile user behavior is very different from desktop users’. Indeed, 61.9 percent of all PPC clicks were from a smartphone during Q3 of 2017. 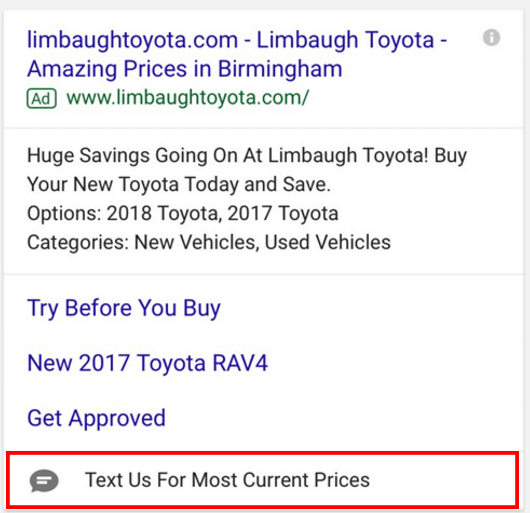 Message Extensions: Allow users to send an SMS to your business directly from the SERPs. Call Extensions: Similarly, users can dial a phone number provided within your ad copy. As always, test different extensions on a small scale before applying them to all of your campaigns. Keep the customer’s journey and intent in mind. Are they searching for a term with several possible outcomes? Consider using a Sitelink extension. Does it look like they’re searching for your retail store on a mobile phone? Include mobile extensions. Facebook Ads are popular among marketers due to the advanced targeting available. But many are still unaware of AdWords’ functionality to do the same. Google collects a tremendous amount of data on their users. So it was only a matter of time before they allowed marketers to use it themselves. That’s where in-market audiences come in. By using in-market audiences within your display ads targeting, you can target users based on their consumer behavior, as well as the content they have expressed an interest in online. So, how does it work? According to Google, data such as sites browsed, the proximity of visits, relevant ads clicked and conversions are all taken into account to categorize users by intent. This means that, while this is limited to the Display network only, you’re able to serve hyper-specific ads to those who have expressed an interest. From persona segments to product categories, the options are many.